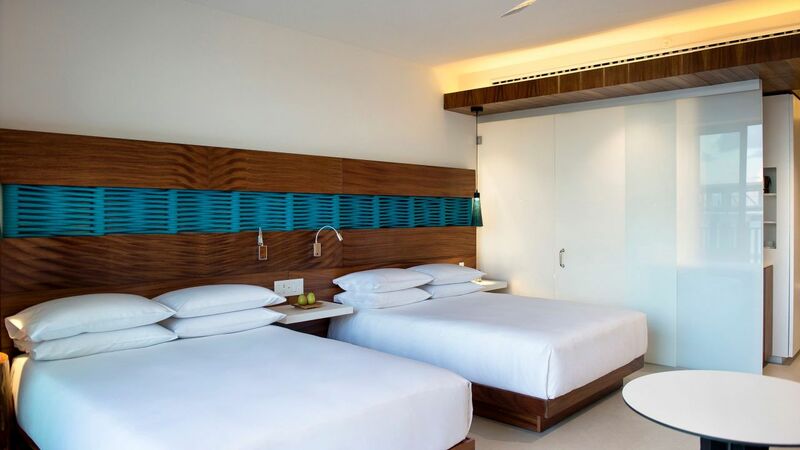 Grand Hyatt Playa del Carmen hotel rooms are comfortable and welcoming spaces to get away after a long day. 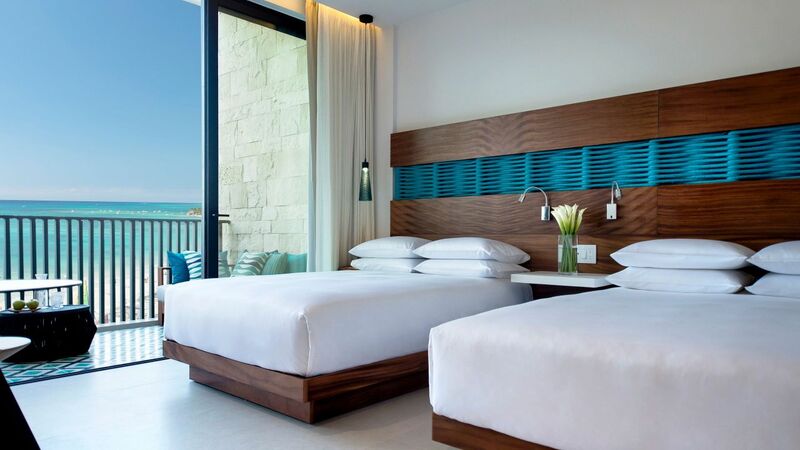 314 spacious guestrooms, including 36 suites with balconies or terraces, are designed to create a sense of an oasis in an atmosphere of modern casualness, overlooking the stunning turquoise waters of the Mexican Caribbean Sea or the uniquely preserved Mangrove. Rooms range from standard to Presidential Suite, each featuring the famous Hyatt Grand Bed, 300 thread count linens, and floor to ceiling windows. A 615-square-foot oasis with striking oceanfront views is the ideal spot to relax while enjoying the natural beauty of Playa. 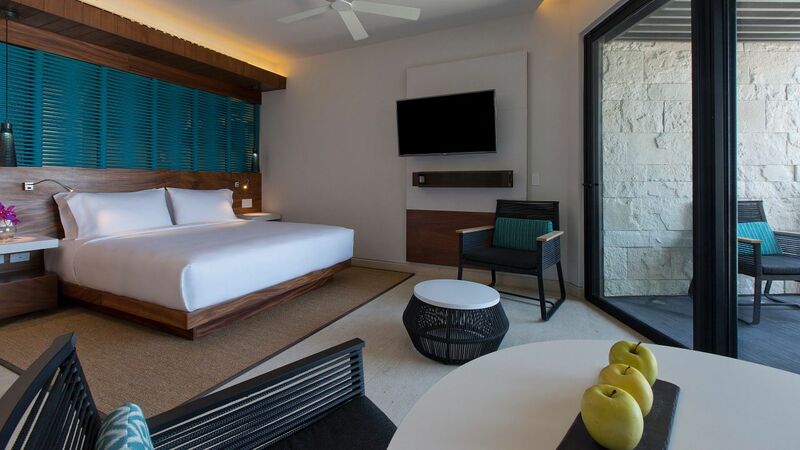 In our Playa del Carmen suites, sleep in the luxurious plush king-sized bed and savor your retreat while you relax and listen to the waves from the chaise lounge on your furnished balcony. A double sink, a bathtub, and an additional rain shower await in the stunning bathroom, and exclusive amenities include wireless Internet and access to the Grand Club lounge with concierge service, continental breakfast, evening cocktails and hors d’oeuvres daily. A room with one king or two queen beds may connect if available. This is a standard suite. See World of Hyatt program terms for upgrade eligibility. These suites are a privileged haven, with striking oceanfront views and uninterrupted access to an ambiance temperature private plunge-pool, a perfect choice for privacy. The 615-square-foot suites feature one king bed, floor-to-ceiling windows and a furnished balcony overlooking the Caribbean. The bathroom has a double sink, tub, and an additional rain shower. Exclusive amenities include access to the Grand Club lounge with concierge service, continental breakfast, evening cocktails and hors-d'oeuvres daily. This is a premium suite. See World of Hyatt program terms for upgrade eligibility. 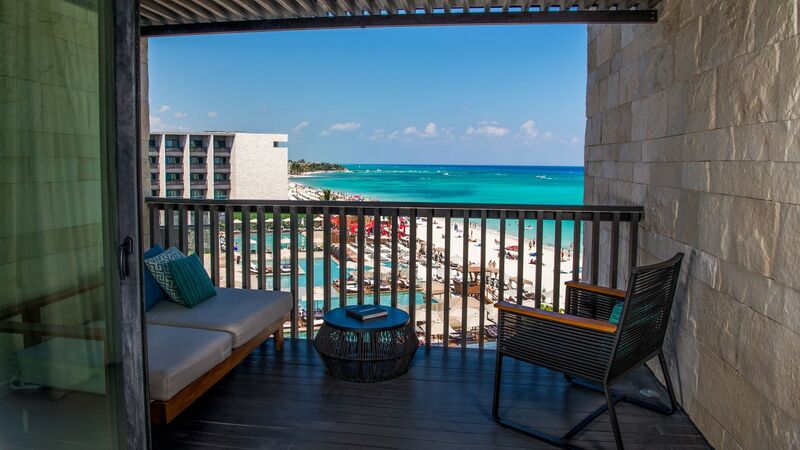 One of the main highlights of the hotel, the Hyatt Executive suites in Playa del Carmen are beachfront located, offering absolutely stunning sea views. You will feel like you are floating above the turquoise waters from your very own private oasis. These large, 820-square-foot suites feature one king bed, floor-to-ceiling windows, a spectacular furnished balcony to enjoy a taste of the outdoor air, and a private, plunge pool (ambient temperature) Additional rain shower, a bathtub, and a double sink await in the beautiful bathroom. Exclusive amenities include wireless Internet and concierge service, plus continental breakfast and evening cocktails and hors d’oeuvres at the Grand Club Lounge. Executive Suite could be connecting to another room, subject to availability. 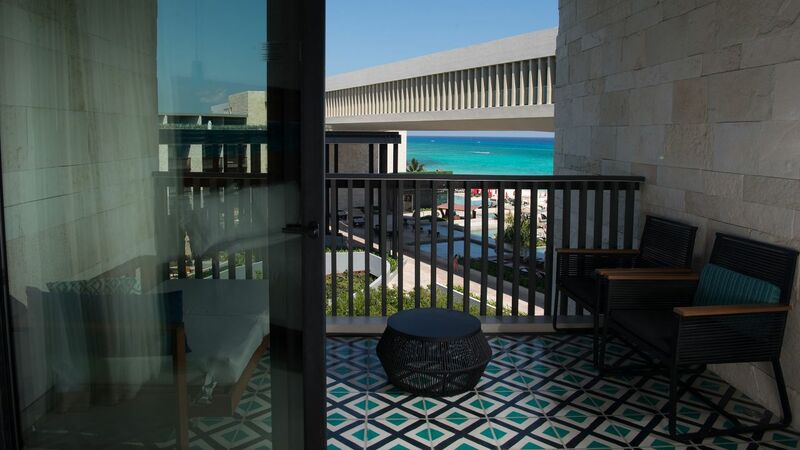 Created to deliver an experience that is second to none, these Playa del Carmen suites occupy a privileged area on the hotel's corner tower, offering absolutely stunning views of the Mexican Caribbean Sea. 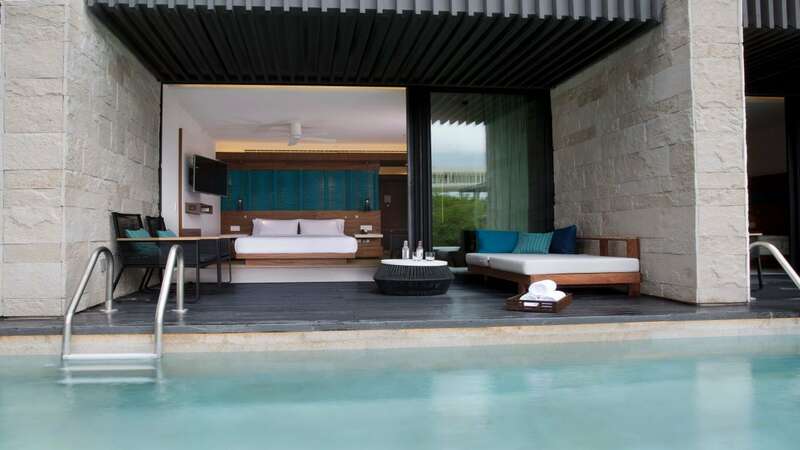 Enjoy privacy, comfort and luxury in these dazzling 1,230-square-foot suites that feature one king bed, living and dining rooms, a private, plunge-pool (ambient temperature) and a large, furnished balcony with chaise lounge, table and chairs. The beautiful bathroom features a double sink, a bathtub, an additional rain shower and spacious closet with vanity area. Exclusive amenities include wireless Internet and access to the Grand Club lounge, with concierge service, continental breakfast, evening cocktails and hors d’oeuvres daily. A room with two queen beds may connect if available. Beach chic design in a palette of blue and sand with modern décor, natural woods and fabric, and natural light welcomes visitors to this 409-square-foot guestroom featuring one king bed, floor-to-ceiling windows, mini hub station and wireless internet to keep guests connected. 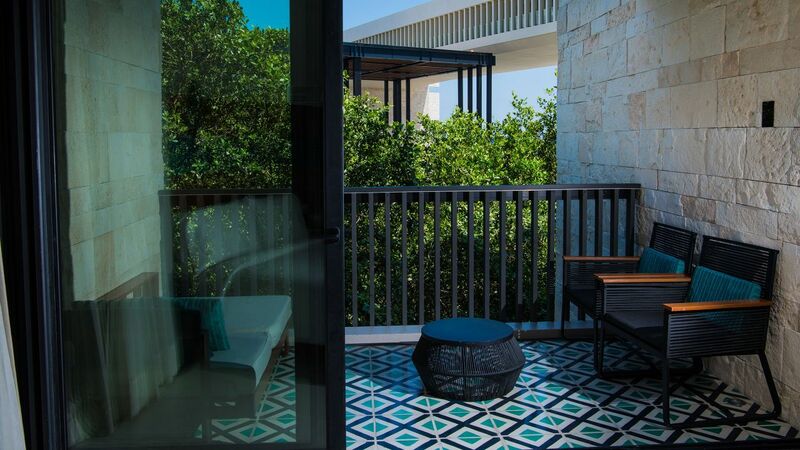 This room includes a furnished balcony, perfect to relax and enjoy views of beautiful gardens, preserved mangrove or the local atmosphere of El Paseo. Additional rain shower and a double sink await in the stunning bathroom. A room with two queen beds or one king bed may connect if available. Beach chic design in a palette of blue and sand with modern décor, natural woods and fabric, and natural light welcomes visitors to this 409-square-foot guestroom featuring two queen beds, floor-to-ceiling windows, mini hub station and wireless internet. 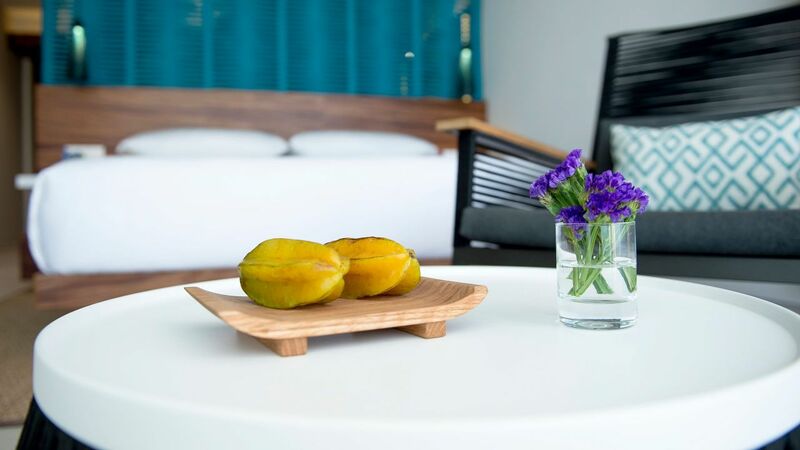 This room includes a furnished balcony, perfect to relax and enjoy the beautiful gardens, preserved mangrove or the local atmosphere of El Paseo. Additional rain shower and a double sink await in the stunning bathroom. A room with two queen beds or one king bed may connect if available. Enjoy impressive views of the beautiful hotel gardens, natural woods and fabric and natural light that welcomes visitors to this 409-square-foot guestroom. The Garden View King room features one king bed fitted with luxurious linens, floor-to-ceiling windows, a mini hub station and wireless internet to keep guests connected. This room also features a furnished balcony, perfect to relax or enjoy the tropical landscape. A double sink and an additional rain shower await in the stunning bathroom. A room with two queen beds may connect if available. Enjoy impressive views of the beautiful gardens amid beach-chic modern décor, natural woods and fabric and natural light that welcomes visitors to this 409-square-foot guestroom. The Garden View Queen room includes two queen beds, floor-to-ceiling windows, a mini hub station and wireless internet to keep guests connected. This room also features a furnished balcony, perfect to relax or enjoy the tropical landscape. A double sink and an additional rain shower awaits in the stunning bathroom. A room with one king bed may connect if available. Beach chic design in a palette of blue and sand with modern décor, natural woods and fabric, and natural light welcomes visitors to this 409-square-foot guestroom featuring one king bed, floor-to-ceiling windows, a mini hub station and wireless internet to keep guests connected. This room includes a furnished balcony, perfect to relax or enjoy the local atmosphere of El Paseo and partial views of the ocean. A double sink and an additional rain shower await in the stunning bathroom. A room with two queen beds may connect if available. Beach chic design in a palette of blue and sand with modern décor, natural woods and fabric, and natural light welcomes visitors to this 409-square-foot guestroom that features two queen beds, floor-to-ceiling windows, a mini hub station and wireless internet to keep guests connected. This room includes a furnished balcony perfect to relax or enjoy the local atmosphere of El Paseo and partial views of the ocean. A double sink and an additional rain shower await in the stunning bathroom. A room with one king bed may connect if available. 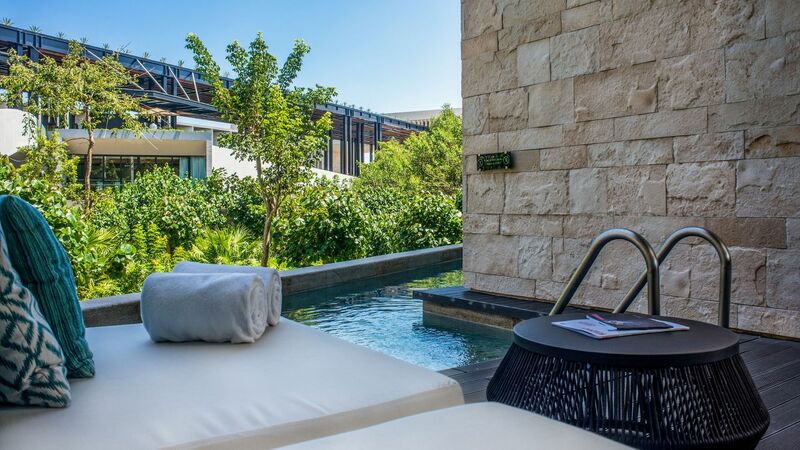 Overlooking the garden or the preserved mangrove through floor-to-ceiling windows, this beautifully appointed 409-square-foot guestroom offers direct access to an amazing pool. Simply step off your furnished terrace to enjoy the water and charmingly landscaped surroundings. This guestroom features a king-sized bed fitted with luxurious linens and stylish furnishings such as a double sink and additional rain shower in the bathroom, and amenities such as a mini hub station and wireless Internet to keep guests connected. A room with one king bed may connect if available. Overlooking the garden or the preserved mangrove through floor-to-ceiling windows, this beautifully appointed 409-square-foot guestroom offers direct access to an amazing pool. Simply step off your furnished terrace to enjoy the water and charmingly landscaped surroundings. This guestroom features two queen-sized beds fitted with luxurious linens and stylish furnishings such as a double sink and additional rain shower in the bathroom, and amenities such as a mini hub station and wireless Internet to keep guests connected. A room with one king bed may connect if available. 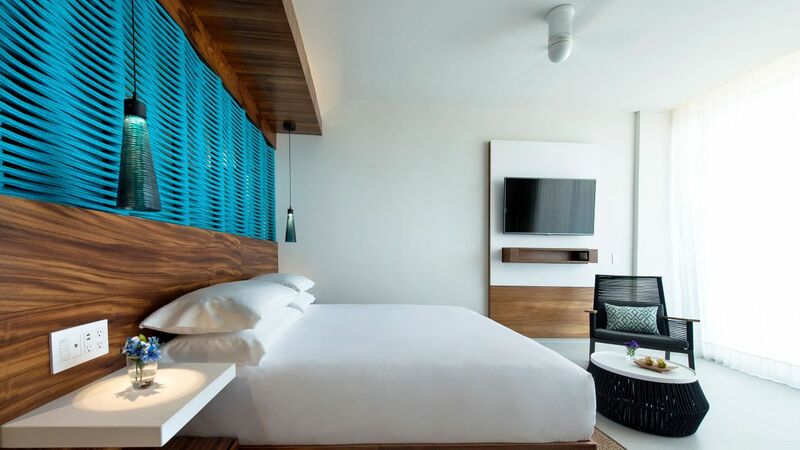 Enjoy impressive views of the turquoise waters of the Caribbean Sea amid beach-chic modern décor, natural woods and fabric and natural light that welcomes visitors to this 409-square-foot guestroom. The Ocean View King room features one king bed fitted with luxurious linens, floor-to-ceiling windows, a mini hub station and wireless internet to keep guests connected. 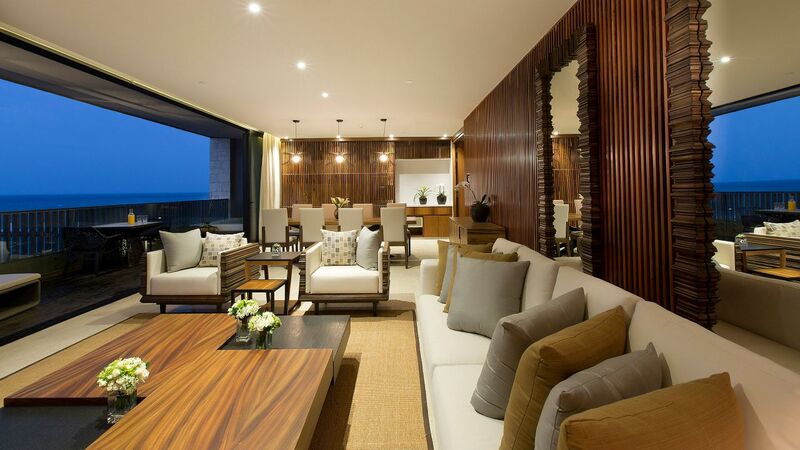 This room also features a furnished balcony, perfect to relax or enjoy the ocean views. A double sink and an additional rain shower await in the stunning bathroom. A room with two queen beds may connect if available. 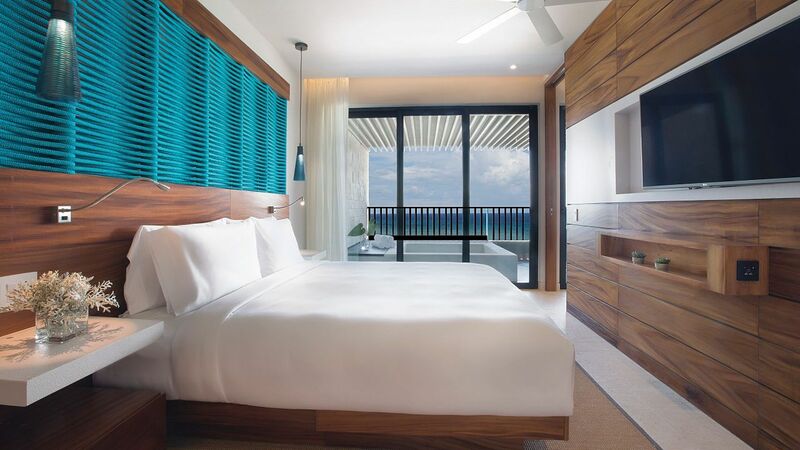 Enjoy impressive views of the turquoise waters of the Caribbean Sea amid beach-chic modern décor, natural woods and fabric and natural light that welcomes visitors to this 409-square-foot guestroom. The Ocean View Queen room includes two queen beds, floor-to-ceiling windows, a mini hub station and wireless internet to keep guests connected. This room also features a furnished balcony, perfect to relax or enjoy the ocean views. A double sink and an additional rain shower awaits in the stunning bathroom. A room with one king bed may connect if available. Enjoy exclusive amenities such as concierge, private check-in and check-out, daily newspaper and access to our private Grand Club lounge serving continental breakfast and evening hors d’oeuvres daily in our Club level accommodations. Beach chic design in a palette of blue and sand, modern décor, natural woods and fabric, and natural light welcomes visitors to this 409-square-foot guestroom that features one king bed, floor-to-ceiling windows, a mini hub station and wireless internet to keep guest connected. 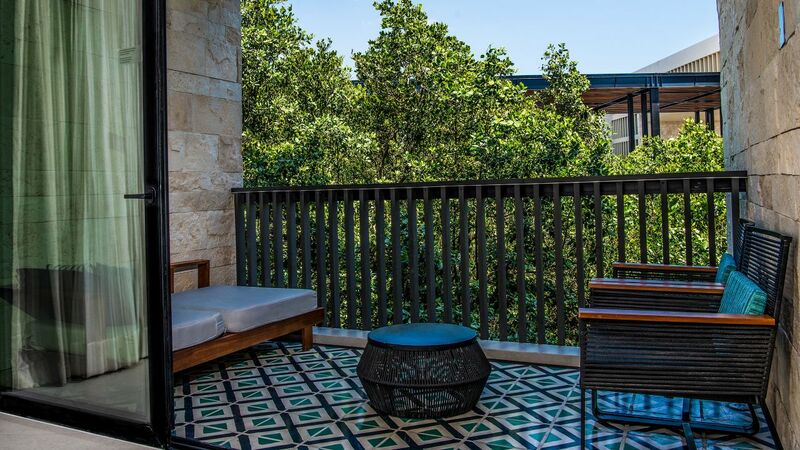 This room includes a furnished balcony, perfect to relax and enjoy views the beautiful gardens or preserved mangrove or the local atmosphere of El Paseo. A double sink and an additional rain shower await in the stunning bathroom. Beach chic design in a palette of blue and sand with modern décor, natural woods and fabric, and natural light welcomes visitors to this 615-square-foot accessible guestroom, featuring two queen beds and an accessible shower. In addition to the amenities of the corresponding standard room type, this room includes closed-caption television, cordless phone and standard fire alarm system with additional emergency strobe light and strobe-light smoke detector. Bathroom conveniences include wide doors, grab bars, rain and and showers. Enjoy exclusive amenities such as concierge, private check-in and check-out, daily newspaper and access to our private Grand Club lounge serving continental breakfast and evening hors d’oeuvres daily in our Club level accommodations. 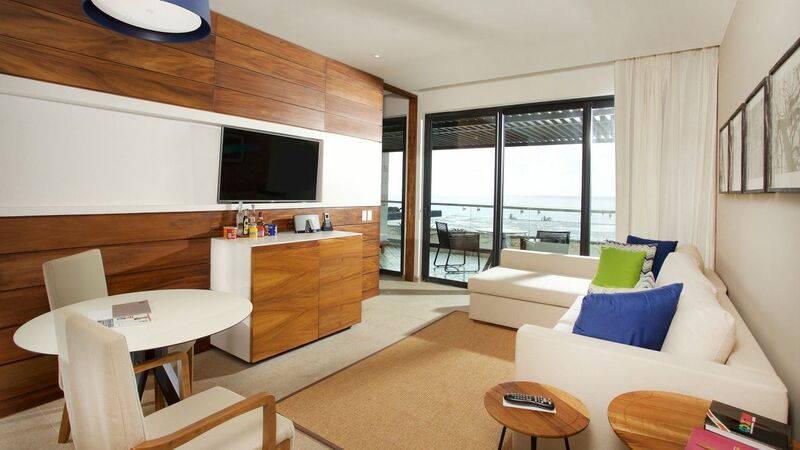 Beach chic design in a palette of blue and sand, modern décor, natural woods and fabric, and natural light welcomes visitors to this 409-square-foot guestroom that features one king bed, floor-to-ceiling windows, a mini hub station and wireless internet to keep guest connected. This room includes a furnished balcony, perfect to relax and enjoy views of the Caribbean and the preserved mangrove. A double sink and an additional rain shower, await in the stunning bathroom. Enjoy exclusive amenities such as concierge, private check-in and check-out, daily newspaper and access to our private Grand Club lounge serving continental breakfast and evening hors d’oeuvres daily in our Club level accommodations. Beach chic design in a palette of blue and sand, modern décor, natural woods and fabric, and natural light welcomes visitors to this 409-square-foot guestroom that features two queen beds, floor-to-ceiling windows, a mini hub station and wireless internet to keep guest connected. This room includes a furnished balcony, perfect to relax and enjoy views of the Caribbean and the preserved mangrove. A double sink and an additional rain shower, await in the stunning bathroom. 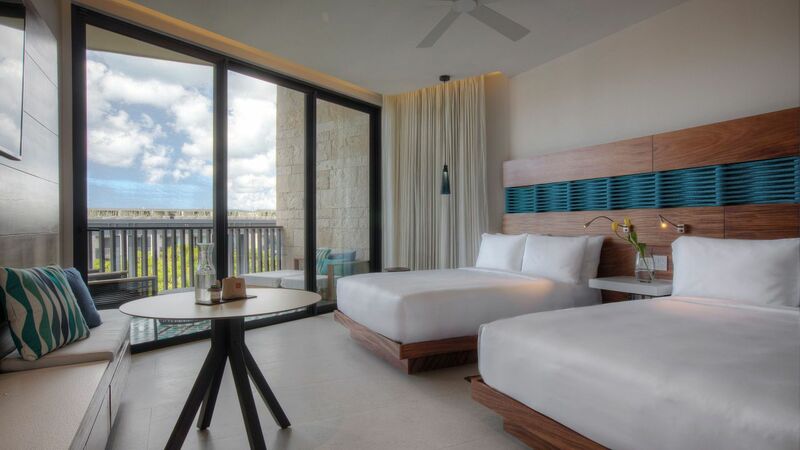 Relax in this spacious and beautifully appointed, 409-square-foot guestroom along the edge of the hotel on the Caribbean coast, featuring the most spectacular ocean view. 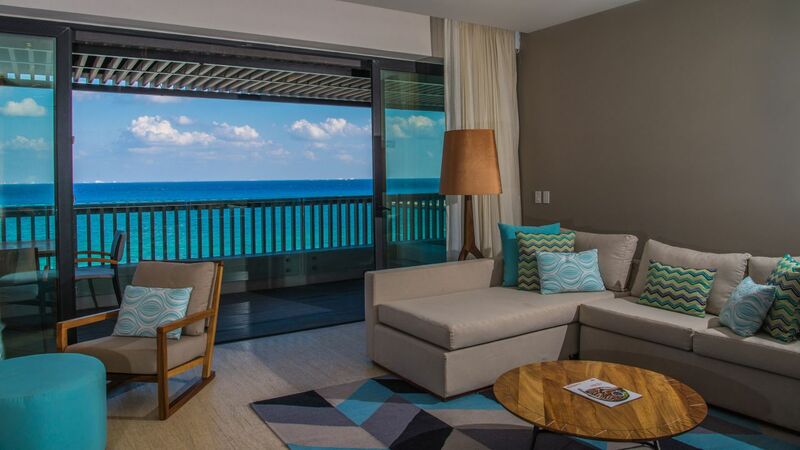 Revel in magnificent, picture-perfect seascapes through floor-to-ceiling windows and from the furnished balcony, where you can relax while overlooking the best beach in Playa del Carmen. Each room features one king bed, fitted with luxurious linens and stylish furnishings such as a double sink, an additional rain shower and amenities such as a mini hub station and wireless Internet to keep guests connected. A room with two queen beds may connect if available. Relax in this spacious and beautifully appointed, 409-square-foot guestroom along the edge of the hotel on the Caribbean coast, featuring the most spectacular ocean view. 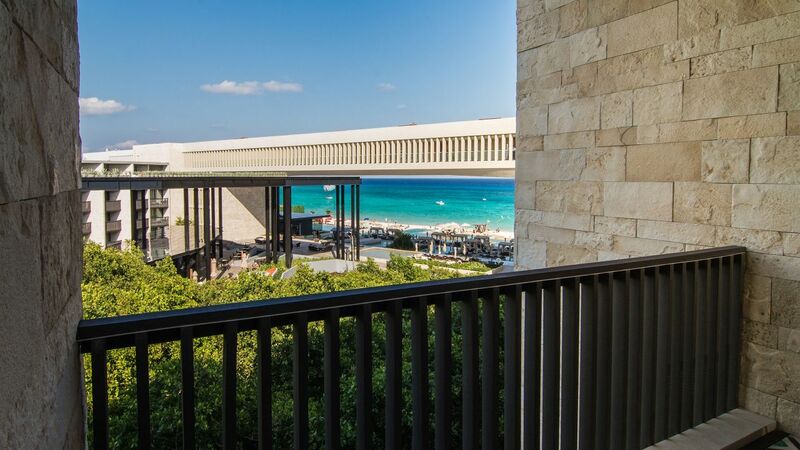 Revel in magnificent, picture-perfect seascapes through floor-to-ceiling windows and from the furnished balcony, where you can relax while overlooking the best beach in Playa del Carmen. 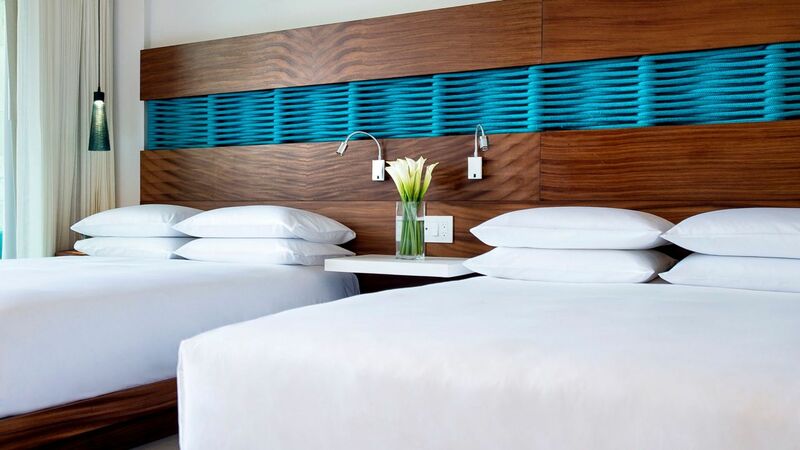 Each room features two queen-sized beds fitted with luxurious linens and stylish furnishings such as a double sink, an additional rain shower and amenities such as a mini hub station and wireless Internet to keep guests connected. A room with one king bed may connect if available. Enjoy exclusive amenities such as concierge, private check-in and check-out, daily newspaper and access to our private Grand Club lounge serving continental breakfast and evening hors d’oeuvres daily in our Club level accommodations. Beach chic design in a palette of blue and sand, modern décor, natural woods and fabric, and natural light welcomes visitors to this 409-square-foot guestroom that features one king bed, floor-to-ceiling windows, a mini hub station and wireless internet to keep guest connected. This room includes a furnished balcony, perfect to relax and enjoy views of the Caribbean. A double sink and an additional rain shower, await in the stunning bathroom. Enjoy exclusive amenities such as concierge, private check-in and check-out, daily newspaper and access to our private Grand Club lounge serving continental breakfast and evening hors d’oeuvres daily in our Club level accommodations. Beach chic design in a palette of blue and sand, modern décor, natural woods and fabric, and natural light welcomes visitors to this 409-square-foot guestroom that features two queen beds, floor-to-ceiling windows, a mini hub station and wireless internet to keep guest connected. This room includes a furnished balcony, perfect to relax and enjoy views of the Caribbean. A double sink and an additional rain shower await in the stunning bathroom.